Once again, Viv and I attempted to do all of our Christmas shopping in the states. Hey, with the dollar almost at par, why not? With kiddies stashed at Grandparents and NEXUS ensuring our smooth entrance into Washington state, we did the leisurely drive to the border. Normally, we'd go all the way to the Premium Outlets in Tulalip and even as far at Seattle itself; but not today. We wanted to stay fairly close due to time constraints. Thus, our first stop was Burlington. After an uneventful time at The Outlets (kinda sad compared to the one in Tulalip...), we headed over to Ross. If I had known what we were in for, I woul d've stayed at The Outlet. With people pushing their carts like rush hour in Richmond and products strewn all over the aisles like an earthquake just hit, it was not for the feint of heart. Sure the prices rock; but to actually find something on the racks where they belong is an exercise in frustration. People! Put your crap back where you found it. Don't put a polka dot bikini in the men's active wear section! After lining up to pay which basically negated any gain from my NEXUS card, we were hungry. Viv thought we should eat right away; but really, in Burling ton? I suggested we make the drive back up to Bellingham, more choices there. And the choice we made was Boomer's Drive-In. 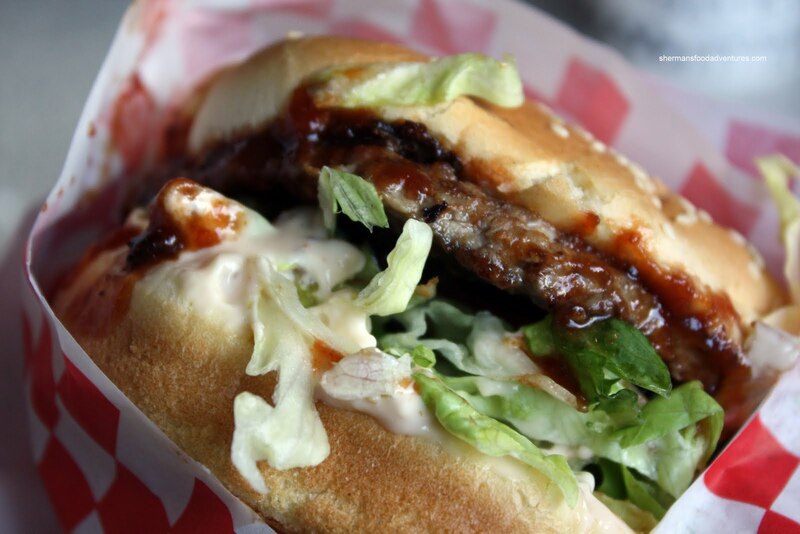 Call it nostalgia, call it inexpensive, call it quick eats. Whatever the reason, it was not something I was expecting to regret. Regret? Let's just say that whenever I'm in the States, I'd prefer to try something other than Asian food. 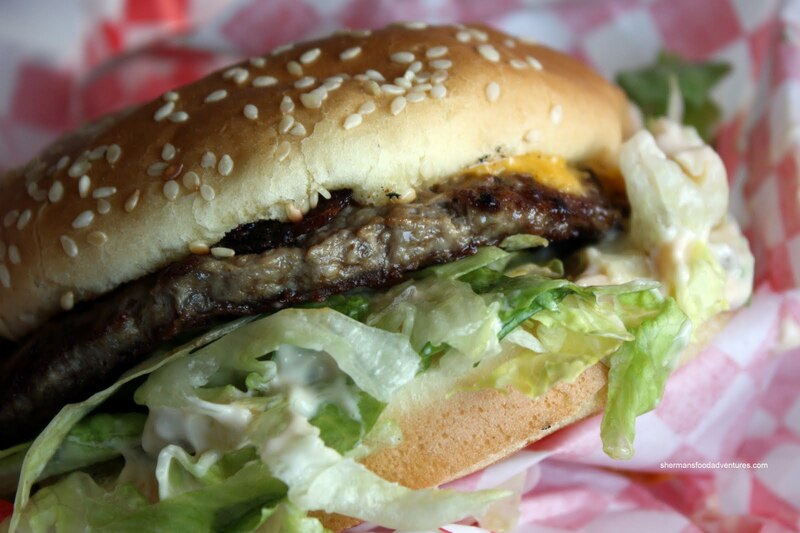 Thus, it is the good ol' burger and fries. At Boomer's, there is the option to do the drive-in or dine in the small restaurant. We chose the latter. Viv decided to try the BBQ Burger with a side of Onion Rings. For the price ($3.69), this was a fairly large burger with lots of fresh lettuce, tomato, smoky BBQ sauce and an obscene amount of mayo. That was probably a good thing because the burger patty was actually kinda dry. But it turned out to be a pretty solid burger with all the components together. 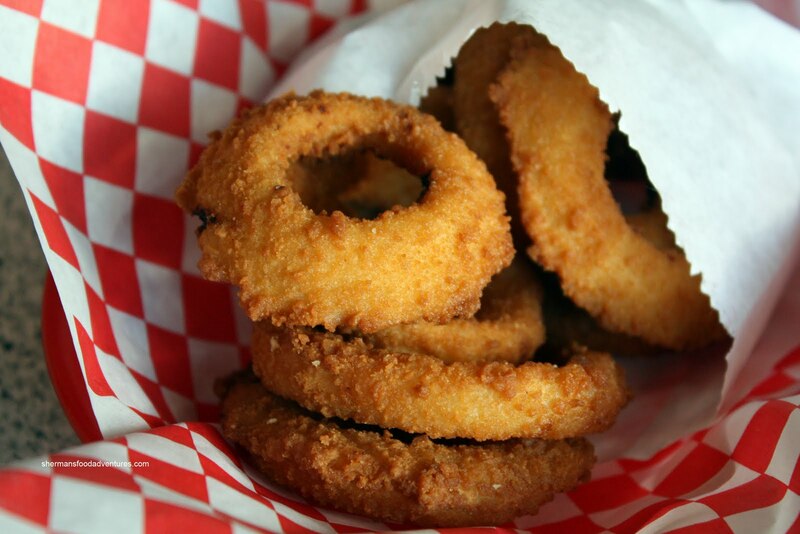 We couldn't be as nice about the Onion Rings though. The breading was far too thick and dense. The end result was a non-crispy product that was a bit hard to eat. For myself, I went for their Combo #1 which included a Cheeseburger, Waffle Fries and Hard Ice Cream Milkshake for $6.99. A pretty good deal in my books. Similar to Viv's burger, the Cheeseburger was not really all that moist; yet the condiments made up for it. It's not a small burger despite the reasonable price. Although the Waffle Fries looked like they were related to Rose McGowen, they were still crispy while potatoey inside. 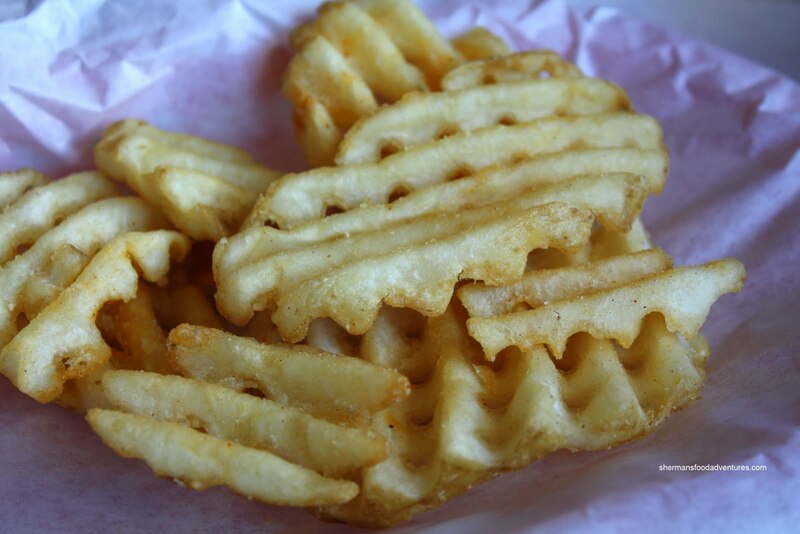 A nice departure from regular fries. We particularly liked the dusting of spiced seasoning salt. Due to the use of hard ice cream, the Vanilla Shake was impossible to drink through a straw, even after sitting for awhile. I was "cool" (forgive my sad attempt at humour) with that though since it meant there was a good amount of ice cream used. It was pretty smooth although it could've used more vanilla other than the ice cream itself. Sure, it wasn't perfect; but really what is? For the prices they charge, we were more than satisfied with our meal. While we were there, there was a steady stream of customers from all walks of life with and without kiddies. And this was in the middle of the afternoon too! 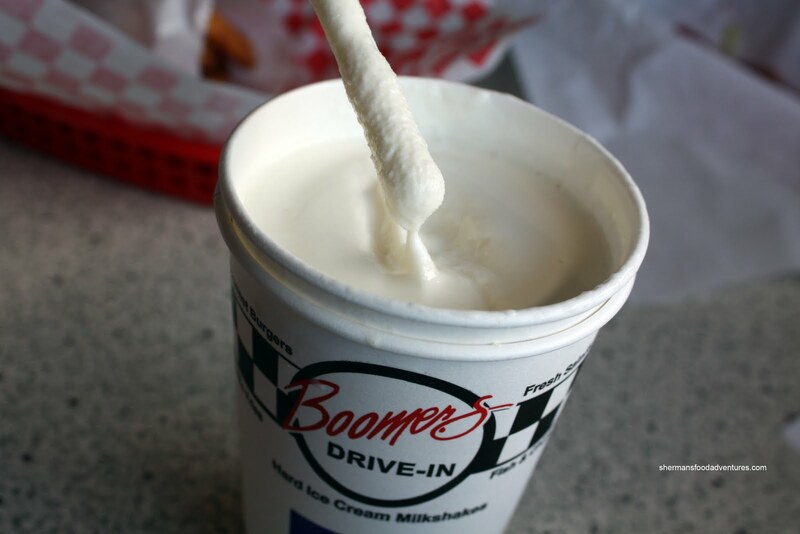 So obviously, Boomer's is doing something right. That "something" is a blast from the past with reasonable pricing, solid eats in a familiar outfit complete with fireplace in the middle of the dining room. Whenever I'm in the area, I usually go to the mexican taco truck down the road past Target, or to Popeye's. Tacos are good (they have tongue). mmm....definitely going to stop by there next time we're in the states!! 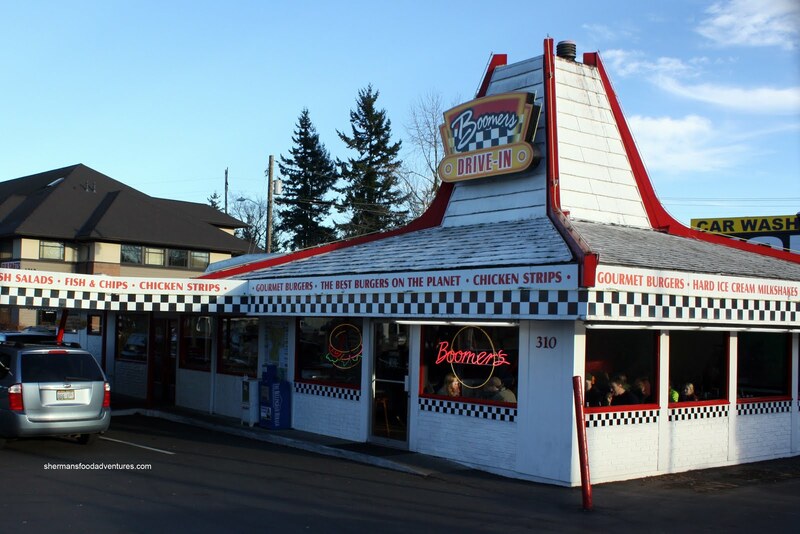 And Bob's Burger & Brew, just off of I-5 on Burlington-Alger Rd, near Cook Rd (3 miles north of Burlington). Are you referring to this taco truck on Guide Meridian, between Pro Golf Discount and Super Gas ? LOL Holly. I love tongue! Yah, I've been to Super Mario's, but not the one you and LR have suggested. Thanks for the tip! I'm not sure if that's the one I'm talking about. All I remember is that it's located on an empty lot along the Guide Meridian.